just a random idea I have been playing with in my head. gonna outline it here and gather some thoughts before I start actually working on it. I have (and love) the trinity tech. I use a reign helios boot for it. really like that boot. stiff, light, durable. but I wanna use quads (especially in china). trinity is 3 point mounting. a quad uses a plate with 2-6 point mounting (usually). Idea: create an adapter plate (probably steel...it has to be stiff) that screws into the boot and the plate. I have made a prototype (yes, this has holes for the quad plate as well, final would probably not have those holes. those would be drilled out, but this prototype is hollow). I have 3d printed it and will see if the trinity mounts line up and all. Then I will make it look nicer and print it solid with kevlar reinforced plastic. ok, so I have a prototype installed, and it is surprisingly close to what I was looking for. I need to move the holes for the trinity mount on the toe a little closer together, I should probably thin the plate down by a millimeter or two, and lower the heel, but otherwise, it seems to do the job. I just stuck it together for these photos and did not tighten anything down. while I feel I like where the wheels are, with the added height, the toe stop requires a dangerous amount of lean before it engages. may have to find a way to move that. btw, the plate I am using for this is from a pair of roller derby viper m4's. absolute trash. while I had rolled down the hallway on the first prototype, I did not try to actually skate on it. Well, here is the second prototype, and it worked quite well. (more text below pictures). 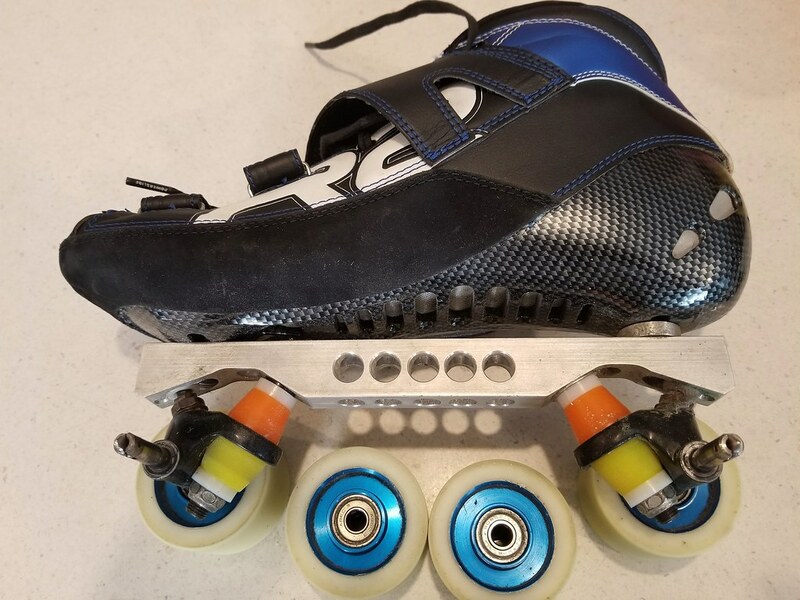 I put the regular hockey skate on and took them for a spin. It actually handled really well. Very responsive, quite comfortable. A little on the tall side for a quad skate, but not a problem. The toe stop wasn't as bad as I initially thought. My foot height is actually lower in this than the hockey skate (by maybe 5 mm, not much). Unsurprisingly this did not last long. After a jump into a hockey stop on a rough surface, I started hearing a bit of crackle. It was still attached and I skated the quarter mile back to my office with no trouble where I managed to rip off the wheels. this is still a prototype and I printed it with cheaper plastic with a hollow fill. I had not initially even planned on skating on this one, but it turned out so well. I have strengthened the areas that failed last time and am now printing a solid prototype using the kevlar plastic (4x as expensive, but still only $20). neat idea! I'm surprised your 'hollow' (internal crosshatching for fast printing and less material use) held up as well as it did. What design tool are you working in? What type(s) of 3D printing available to you? What printing materials have you got? I've got some 'thoughts' on your design if you are open to input. the 'hollow' design did surprise me. it did break after about half a mile though. Materials....the green stuff is some standard plastic they provide that may or may not be biodegradable. comes in a lot of colors, but they had a couple spools of green on hand and I didn't care. the black plastic you will see in a moment (about to post an update) is ..."Onyx chopped carbon fiber filament, a plastic which results in both a strong and flexible material. Due to the material properties, the resulting product is often very durable and is at reduced risk of thermal deformation or warping as it is expressed onto the build plate. " (copied from a website). I also printed the black one completely solid. That's it as far as what is here, but I imagine I could do better somewhere else. in the past I have worked with metals, but weight was rarely an issue there. So the 3rd prototype finished printing and I took it to the rink and thoroughly abused it for the entire session. It held up with almost no signs of wear. oh, and once I'm happy with this, I'll post a version of the plates without holes for the quad plates, just in case someone wants to try their own trinity boots on a quad plate. What design tool are you working in? forgot to answer that. tinkercad. for something as simple as that, tinkercad does fine. I've used blender before and I have an older version of AutoCAD, but I feel like those are both a bit overpowered for what I'm doing here. I've recently retired from a fun career of hands-on MCAD/ECAD/FEA and simple as well as complex 3D printing. I'm a mechanical engineer specializing in aircraft avionics. Given your location I'm guessing you might be familiar with aircraft. I see you draw on quadpad! Kindred Spirit? and the really really smart have always been somewhere else!! I took the skates out for a spin friday evening for a few miles. not bad, but definately harder than using an inline on the roads here. Saturday I used these skates for part of the session at one of the rinks. Worked quite well. I think mission success. As far as sharing the model, I'd be glad to, but I'd like to share it upon request just so I know where it is going, so, if you have trinity boots and want to mount quads, let me know. Those quad plates re too far back. There is not enough reinforcement where the hardware mounts. Not being a troll. Peace.